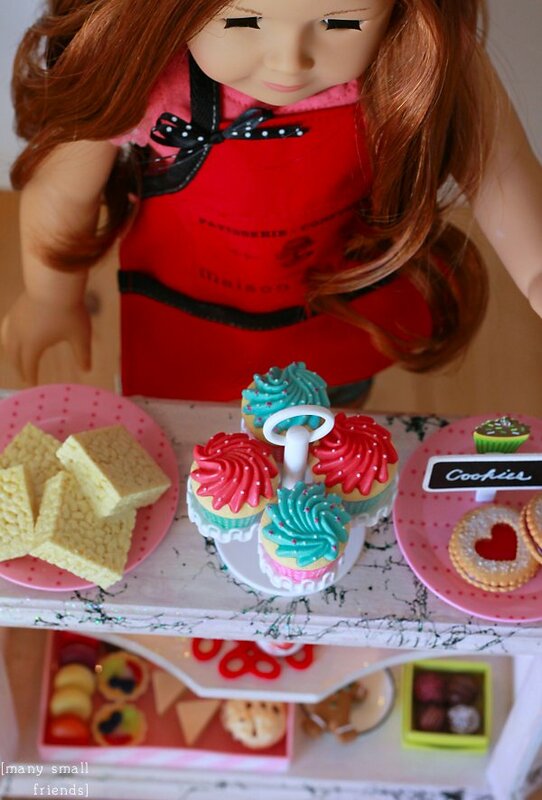 Still feeling inspired by American Girl’s 2015 bakery theme? My small friends and I sure are. We made this lighted Bakery Case in just a few hours (not counting the bazillion hours spent trolling every.single.aisle in Hobby Lobby) and for about $30. 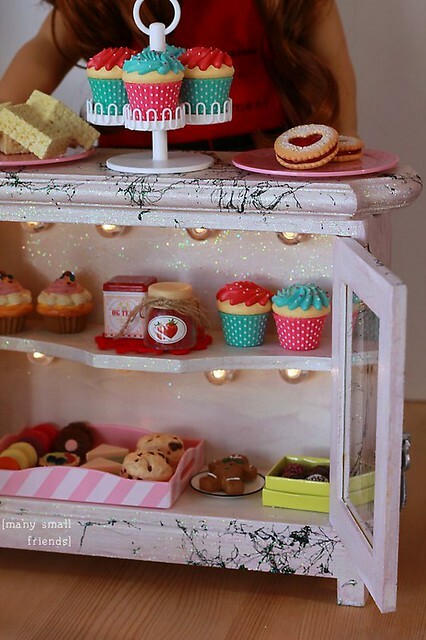 If you already have paint and other common craft supplies on hand, you can make your own lighted Bakery Case for even less! 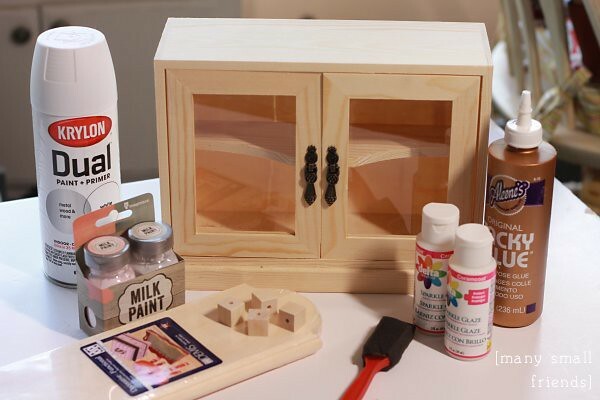 Pre-made wood cabinet from Hobby Lobby ($11.99 before 40% off coupon) Please note that the doors in this cabinet are glass paned and probably not appropriate for play by younger children. 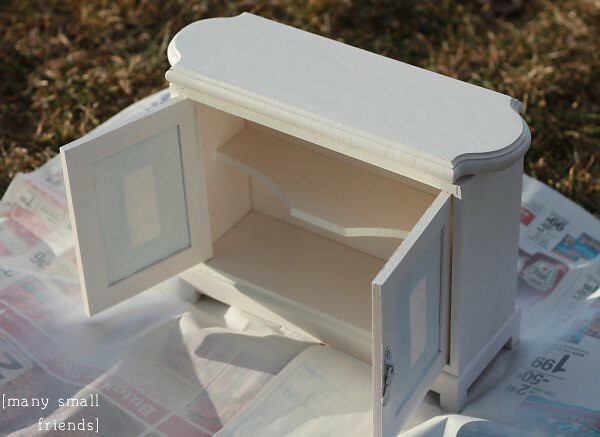 Primer [optional] and Paint – I used Krylon Paint+Primer and Imaginisce Milk Paint (but I would suggest using acrylic paint instead. If you use acrylic paint, you probably don’t need to prime before painting). Glue the wood plaque (the “counter”) to the top of the cabinet. This is an optional add-on. You could use the cabinet as-is, but I think it adds a lot to the finished Bakery Case. I also glued 4 small blocks to the bottom of the cabinet at each corner to give the case a little additional height. Allow the glue to dry before proceeding. 1) Cover both sides of the cabinet windows with paper and masking tape to avoid getting paint on the the glass. 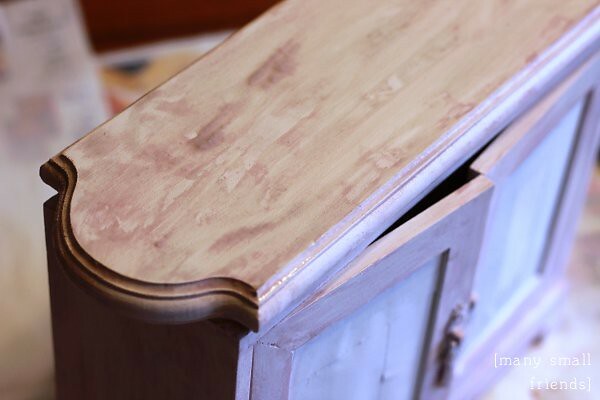 2) Lightly sand the cabinet and then wipe away the dust with a damp cloth. 3) Spray white primer over the entire exterior and interior of the Bakery Case. I used two coats. Allow to dry before proceeding. 1) Lightly sand the primed Bakery Case to remove the “bumps” and rough patches that spray primer often leaves behind. 2) Paint the case in any way you find pleasing. I was hoping to achieve a marbled look, so I chose a pink and grey color scheme. I used milk paint because I found it on clearance at Joann and I was intrigued! 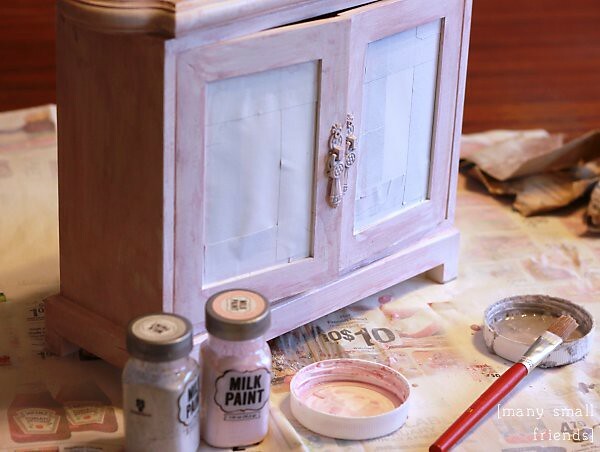 If you use milk paint, mix it to a thicker consistency then suggested on the packaging. If I were to do this project again, I would probably choose to use inexpensive acrylic paint instead. I painted the interior of the case as well, but I didn’t bother adding much detail. After I painted my case and allowed it to dry, I used Krylon’s Webbing Spray to get a marbled look. I found the webbing spray at every craft store I visited (Joann, Michael’s, and Hobby Lobby) . It is priced at about $7 and I used a coupon to make it more affordable. This webbing spray is odd stuff! It’s paint, but it shoots out of the can like “silly string” or like spider webbing. Essentially, you shoot it into the air and allow it to fall lightly onto your project. You don’t have a lot of control with the outcome, which is both exciting and alarming at the same time. I have to tell you, at this point in the project, I wasn’t sure I liked where it was going. It has a bit of a 1988 vibe, don’t you think? 😀 I had a good laugh because once I’d seen the 80’s in this project, I couldn’t un-see the 80’s. You guys, it’s totally rad. 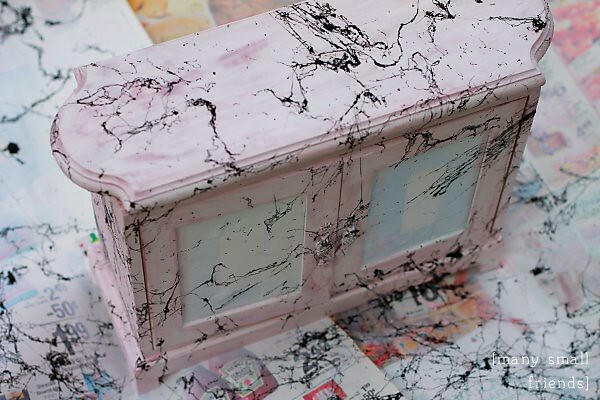 I did not marble the inside of the Bakery Case, which I think was the salvation of this paint job. When displayed with the doors open, the marble effect is only visible on the counter top, which I am very pleased with. With the doors closed, it’s a little… much. If I had this to do over, I might only marble the counter top and then glue it to the body of the cabinet, which I would leave solid white. I have toyed with the idea of sanding and re-painting the lower part of the cabinet, but that sounds like a lot of work. Finally, I used Delta Sparkle Glaze to add a shiny finish. 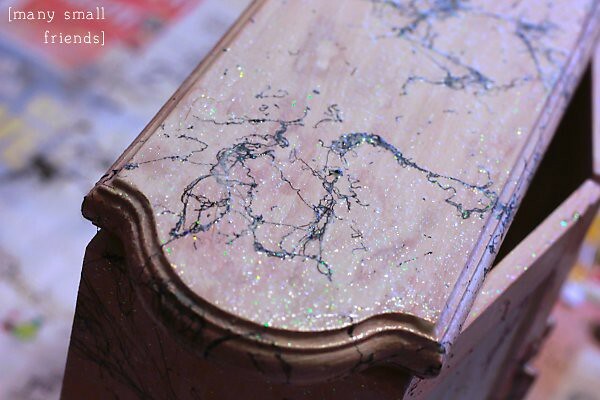 I thought the glitter in the glaze added to the marble look as well. In addition, I used grey acrylic paint to paint over the hardware on the doors. I found this set near the paper mache items at Hobby Lobby. 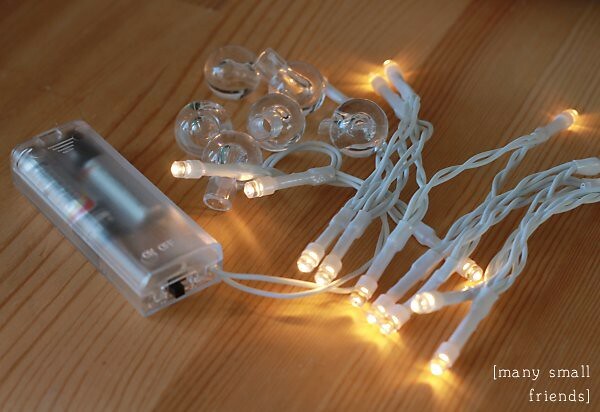 They are intended to be used as marquee lights in a craft project. The lights require 2 AAA batteries. I love that this lightening doesn’t need to be plugged in, since this makes the Bakery Case very portable and without wire clutter. Currently I’ve got the extra wiring and battery pack sitting behind the Bakery Case, but I will eventually duct tape it to the back. I didn’t take photos of the drilling and lighting process, but it was simple and hopefully self-explanatory. I drilled holes in the back of the case that were the same size as the bases of the clear marquee bulbs. Then I pressed the marquee bulbs into the holes, and inserted the lights from behind the case, into the bulbs. If you can’t find marquee lights, I think this could also be accomplished with a small holiday lights set, which seem to be available year round at most hobby stores. You’d simply drill the holes and press the lights through holes. You might need some craft putty to hold the lights in place. If you guys have other ideas how to achieve a similar effect, please add in the comments below! To make the signs, I used a variety of pre-made chalkboard papers and products which are ubiquitous in craft stores at the moment. I used a Bistro chalk marker to write on the signs. You could also use a regular white or silver marker, but I was happy with my choice to use something erasable, since each sign took me about twelve tries to get “right”. I’m still tempted to redo some of them! Repeat after me: Perfection is the enemy of good. 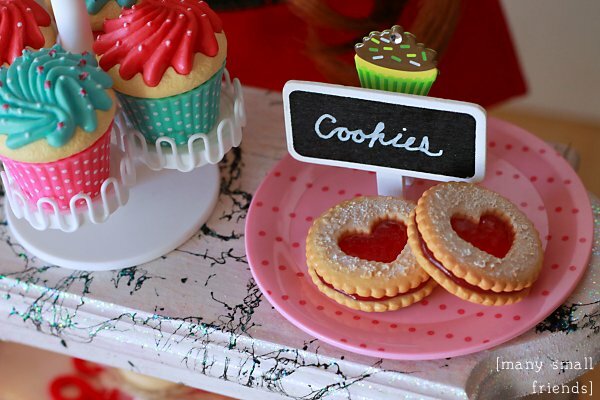 The mini chalkboard signs are made by the Paper Studio. The cupcakes on the signs are actually metal brads (also by the Paper Studio) that I clipped to the back of the chalkboard signs. The doll food in our Bakery Case is a mix of American Girl, Our Generation (from the new Tea for Two Set), and The Queen’s Treasures. Ada is wearing her Patisserie Apron, of course! Please let me know if you have any questions about this project. 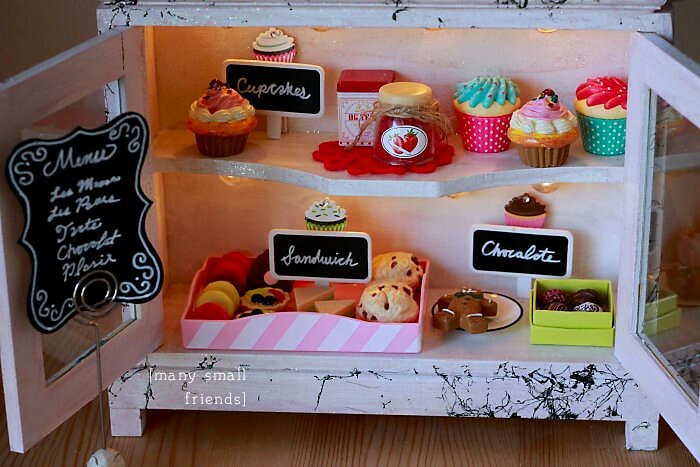 If you make your own Bakery Case, I hope you will link pictures in the comments below! 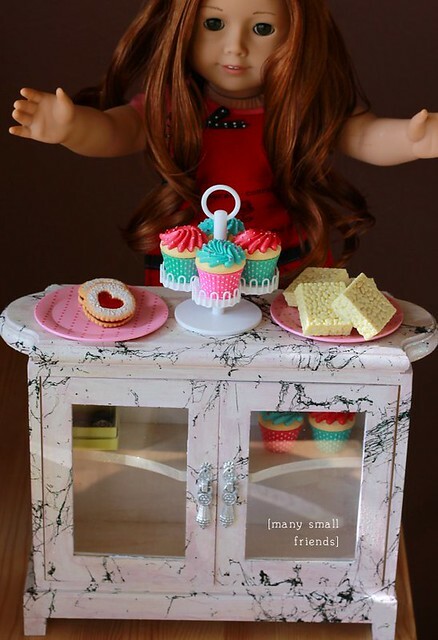 This entry was posted in Free Doll Patterns and Tutorials and tagged 18" Dolls, American Girl Dolls, Doll DIY, Doll Furniture, Doll Tutorial, Girl of the Year.